The boats are situated at Pier 5 in the harbour in Hanstholm. 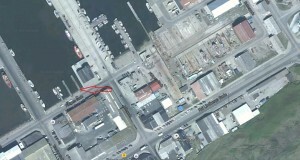 For gps they are located right across from Fibigersgade 10, 7730 Hanstholm. Click on the photo to see it in a big format. M/S Mølboen, M/S Yellow Reef and M/S Bonito, sail from Hanstholm to “The Yellow Reef” everyday from the middle of March to the middle of October. Shipwreck/special tours can be arranged by prior agreement. If you are not too keen on filleting your own fish, we can arrange for this to be done for you. If you are unsure as to whether or not you have sea legs, take a seasick tablet 3-4 hours before your trip or wear an anti-seasickness patch, or else your whole day can be ruined if you start to feel poorly on board. Wear sensible clothing, bring waterproofs if possible. Most fishing is done using 200-500 g jigs as well as snoods, rubber and octopus rigs. Use a good jig rod, multi-reel and 0.60 nylon line or 0.35-0.45 spun line. If it’s your first time fishing at the reef and you don’t particularly want to invest in a whole lot of expensive gear, you can hire tackle on board and jigs can be purchased. Most fishing takes place at a depth of 30-150 m.
Everyone between the ages 18 and 65 must hold a valid fishing license. 24 hr license 6 €, week license 20 €, annual license 28 €. Week license and annual license must be booked in advance. Everyday from 6 a.m. til about 5 p.m.